SCOPE Architekten GmbH completed the Innovation Center 2.0 offices for software company SAP, located in Potsdam, Germany. The Innovation Center 2.0 is a special place for software development and a special place for SAP. On the outside, the new, four-story glass cube adapts with rotating balconies to the inventory and is characterized by its exciting concrete pillars structure with industrial character, which breaks the glass facade in numerous diagonals. The building resembles an open workshop hall in which all floors are interconnected via a cross-story airspace. In the middle of the building is a closed concrete core that receives all serving and technical features of the building such as the emergency stairwell, the elevator, the technical infrastructure and the sanitary system. Entering the building through the main entrance the room opens up in the shape of a large airspace. A large light installation on the ceiling and a green wall catch the view. In this airspace also the huge main access can be found. Single-flight stairs of exposed concrete, steel and matte black levels oak floors combine the floors with each other. The single-flight stairways end on different deep galleries that receive communication and residence zones. The airspace with its diverse compounds illustrates the architectural ambition of making communication an essential part of a vibrant corporate culture. On the ground floor the coffee bar, the workshop rooms, the large design thinking – area and the meeting rooms are arranged around the core. In these spaces, the idea of a flexible and agile working environment is most evident. Large whiteboard surfaces are hanging from the ceiling and can be moved. The great design thinking space is characterized by constant change and enables multiple workgroups in various sizes to work together or to give presentations for up to 200 people. The meeting and workshop rooms are also expandable by flexible partitions. All the furniture and the stands are on wheels and support agile working. On the upper floors the office spaces are U-shaped around the core and are separated by large glazing of the atrium. The workstations are designed to be as flexible as the spaces on the ground floor. Here flexible working groups can also be assembled by movable whiteboards and scrollable tables. The three working groups on each floor are surrounded by differently sized meeting rooms and think tanks at the corners of the building. Micro meeting cells- small, sound-proof areas for telephone calls, two-man conferences or personnel meetings – complete the space. The material mix including wood, planted sideboards and leather seats visually and haptically meets the industrial charm of raw concrete walls, screed floors, visible installations and cooling fins on the ceilings, which are also acoustically effective. The tidy atmosphere is plain, reduced and stimulating at the same time. 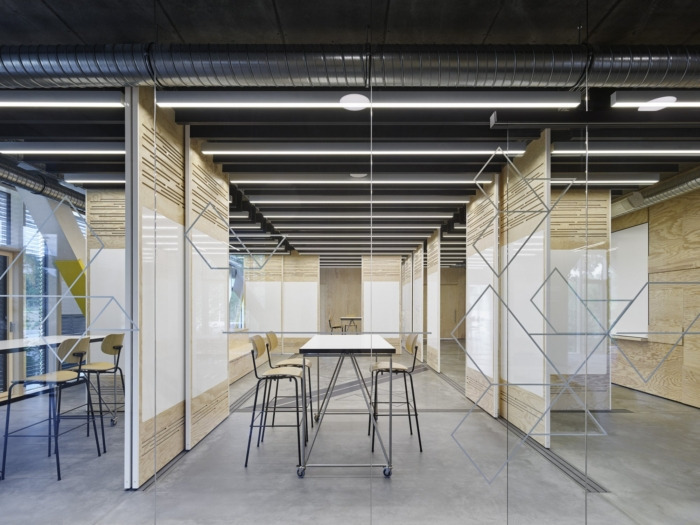 Visual protection on glass walls separate functional spaces from communication areas and also create connections and transparency. The holistic approach of openness, cooperation and flexibility can be felt everywhere. On the third floor, the atrium opens to a larger communication zone, through which the roof terrace of the building can be accessed. In addition to far reaching views over the Jungfernsee and the adjacent development area, the rooftop also serves as advanced workstation area during the warm season. Individual furnishings such as swinging seats, benches and sofas encourage different working techniques in these special zones. This custom functionality is additionally reinforced by the load bearing structure that can be used as a seating unit.